The time period of Shivat Tzion (when the Jews returned to the Land of Israel from the Babylonian exile) portrays the struggles of a community in flux, one in which neither purpose nor journey is clear. The issues of the Second Temple period are perhaps the most relatable to the struggles of modern-day Jewry, and yet the books that portray this time are often overlooked and understudied. 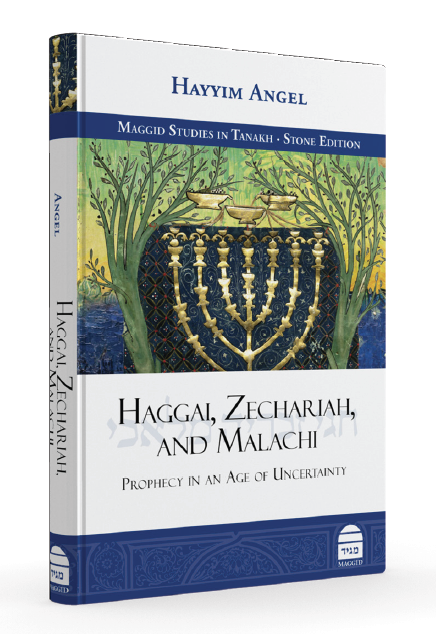 As a result, Rabbi Hayyim Angel’s work, Haggai, Zechariah, and Malachi: Prophecy in an Age of Uncertainty, adds not only to the corpus of Biblical exegesis, but opens up a time period that the modern-day student would be wise to consider in shaping his or her religious worldview. The story begins in 539 bce when Cyrus the Great of Persia inexplicably allows his Persian subjects to rise up from their captivity and return to their homeland to build a Temple to God. While the Book of Ezra glorifies the mission as the culmination of the redemption prophecies of Jeremiah, only a small group of wide-eyed and hopeful immigrants answer the call and make the difficult journey to a desolate and dangerous land, the rest of Jewry content to live out their lives in the Diaspora in relative ease and await the coming of the Messiah. The fears of the Persian Jewish community seem well founded when instead of a glorious homecoming, the returnees are met with both internal and external difficulties. Internally, the group is fractured. The older generation, who had experienced the glory of the Temple of Solomon are embittered by the plight of the Second Temple. They scoff at the meager foundation that the new community was able to build for the Temple and spread ill-will toward the leaders. The younger generation, who had been content with the smaller and less glamorous model, is suddenly unsure whether to continue supporting the new building. A much-anticipated dedication ceremony ends in discord. All the while, the larger community in the Diaspora watches events unfold in faraway Israel, waiting to see if this is truly the time of redemption where God will reveal His glory, or just another stage in the unfolding narrative of the wandering Jew. Politically, the Judean community is not faring much better than they are religiously. When the Jewish leader Zerubbabel rejects the help of the nearby Samaritans, they in turn send lobbyists to advise Cyrus to withdraw his support from the Jews, which he does. The community, so full of hope, turns its attention to more mundane matters of farming and building homes. To make matters worse, a short time later, a famine rips through the country. Any thoughts of beginning the large building project are redirected toward wrestling food from the parched land. The Jews turn their backs on Jerusalem and for eighteen years the Temple foundation stands only as a reminder of what could have been. It is this dismal scene that the last prophets Haggai, Zechariah and Malachi enter. Armed only with the word of God, they must persuade a defeated people to defy all logic and dedicate themselves to God and to each other. They must simultaneously uplift a despondent people, navigate a relationship in which most Jews are not living in the Jewish homeland, and teach a people to relate to God when His presence is no longer manifest through miracles and prophecy. It is hard to escape the parallels between the early Second Temple generation and contemporary times. The heart of this volume is encapsulated by the subtitle of this book—Prophecy in an Age of Uncertainty. One of the major themes that Rabbi Angel develops in this book is the uncertainty surrounding messianic redemption at this time. The shocking nature of the Cyrus redemption, which allowed the Jews to return to their ancestral homeland, a political move without precedent in the ancient world, seemed to radiate God’s presence. This messianic view was bolstered by the timing of the event, which followed an almost exact timeline of Jeremiah’s prophecy. Both the community in Persia and in Israel, however, were skeptical. Rabbi Angel describes in the volume how the Shivat Tzion redemption did not include elements of the messianic redemption that the community had expected, including the ability to build a large and expensive Temple to parallel that of Solomon. It was additionally missing spiritual elements of the Temple such as the Ark of the Covenant. The community in Persia was content to wait while the community in Israel was despondent and stopped building the Temple. The burden to help navigate this crisis and forge a way forward fell to the three last prophets: Haggai, Zechariah and Malachi. It is hard to escape the parallels between the early Second Temple generation and contemporary times, as both groups of Jews contemplate the religious meaning of the return to Zion and attempt to understand their personal roles in the process of redemption. Rabbi Angel describes the tension of the community as wondering “whether this complex period was indeed a period of redemption.” Rabbi Angel notes that God did not manifest His presence even after a community was established in Israel and the Second Temple built. “The Jews had no king; they were weak and vulnerable, and the Persian Empire dominated the region.” Haggai and Zechariah exhorted the people to recognize the messianic potential of their era and dedicate themselves to serve God to realize this potential. This prophetic insight, however, remained unfulfilled and the Second Temple generation did not witness the redemption during their era. The uncertainty of the time period persisted with the Jewish community being split for the first time in history between two major centers—one in Israel and one in Persia. That Rabbi Angel includes in this volume a brief commentary on the contemporary Book of Esther, which takes place in the parallel center, speaks to the broadness of the Jewish community at the time. Both the Jews of Israel and of the Diaspora needed to reimagine their connection to God at a time when His presence was concealed. The fact that God’s Name does not appear in the Book of Esther also speaks to the waning of the prophetic ideal during this time period. The last three prophets, Haggai, Zechariah and Malachi, form a bridge between the classical time period of prophecy, in which the prophets conveyed an intimate understanding of God’s will to the people, to a time in which human initiative in the halachic process and Torah study are the main conduits of God’s will. Rabbi Angel’s work reads like a modern commentary on all three prophetic books. Rather than giving an overview of the topics covered in the works, Rabbi Angel comments on each section of each book, analyzing particular verses or sections that elucidate a theme. Rabbi Angel’s style of commentary merges traditional and academic scholarship, citing medieval exegetes such as Rashi or Ibn Ezra, in addition to religious scholars such as Rav Yoel Bin-Nun and Dr. Mordechai Zer-Kavod, as well as the scholarship of the academy and relevant references to archeological discoveries. It is no coincidence that the endorsements on the back of the book range from the yeshivah to the academy as well. Rabbi Angel’s voice as a master teacher comes through in this volume. The exegesis ranges from the broad to the minute as Rabbi Angel expounds on large, overarching themes as well as on technical conversations about language and commentaries, with the clarity that one would expect from a natural teacher. It is for this reason that Rabbi Angel’s book will be invaluable to any educator interested in teaching these Biblical books. The Jewish community of the Shivat Tzion did not experience the redemption that the prophets thought was imminent. They did, however, leave a rich legacy of thought that can inform the struggles of the modern Jewish experience. It is because of this community and its leaders that we know how to navigate a naturalistic redemption, the loss of something as integral as prophecy, and the splintering of the Jewish community into two centers. In opening up this era and these works, Rabbi Angel reminds us that there truly is nothing new under the sun. Rachel Besser teaches Tanach and philosophy at The Frisch School in Paramus, New Jersey, where she also serves as the Nach Department chair and is a member of the Israel Guidance Team.